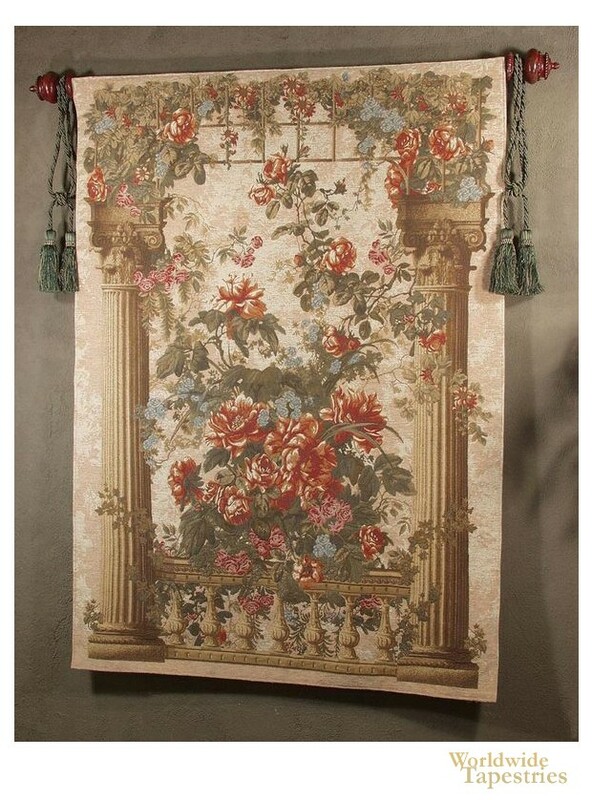 Pergola Floral tapestry shows a rose balcony scene filled with bouquets and climbing roses. This rose balcony tapestry is a celebration of the beauty of nature with the beauty of architecture. Combining these two elements of still life and architecture has produced gorgeous tapestry works in France and Belgium. Here in this Belgian tapestry we see grand and ornate columns and trellis, completely decorated with roses. Full of rustic detail and color palette, this floral Belgian tapestry "Pergola Floral" is backed with a lining and has a rod pocket for easy hanging. Note: tapestry rod and tassels, where pictured, are not included in the price. Dimensions: W 50" x H 69"